Fireworks displaying over the Chuch’e Tower in east Pyongyang held on February 16, 2018 to commemorate the birth anniversary of late DPRK leader Kim Jong Il (Photo: KCNA). 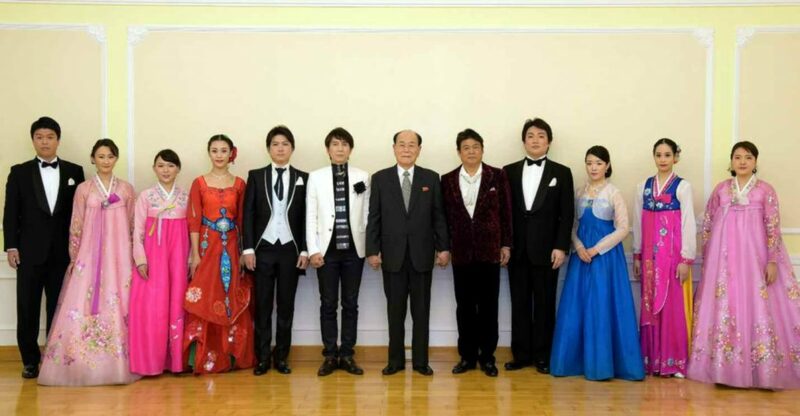 Supreme People’s Assembly Presidium President Kim Yong Nam poses for a commemorative photo after meeting with an art troupe of the General Association of Korean Residents in Japan at the Pyongyang Grand Theater on February 17, 2018 (Photo: Rodong Sinmun). 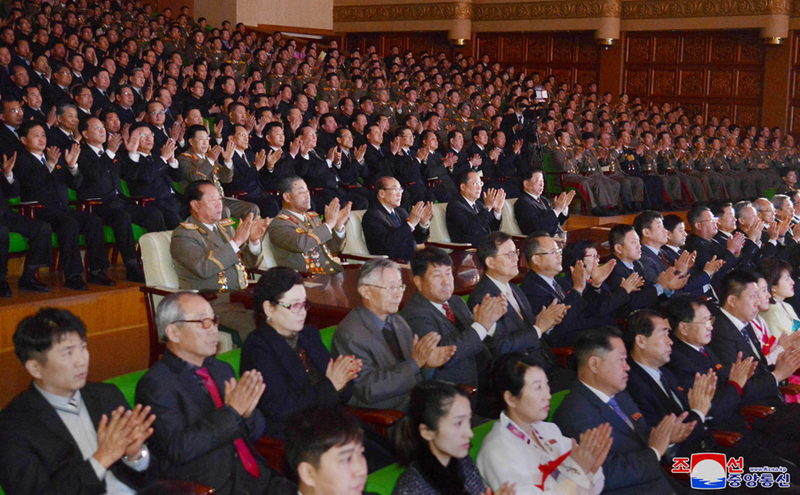 Senior DPRK officials watch a concert on February 16, 2018. Among those in attendance are SPA Presidium Vice President Yang Hyong Sop, Minister of People’s Security Choe Pu Il, KPA General Political Department Director VMar Kim Jong Gak, Pyongyang WPK City Committee Chairman Kim Su Gil, DPRK Vice Premier Kim Tok Hun, State Planning Commission Chairman and DPRK Vice Premier Ro Tu Chol and DPRK Foreign Minister Ri Yong Ho (Photo: KCNA). 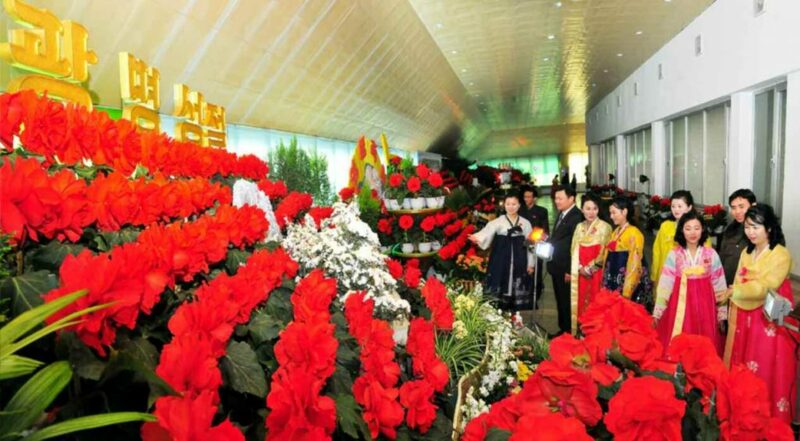 A variety of meetings and cultural events were held to mark the birth anniversary of the late DPRK leader Kim Jong Il (Kim Cho’ng-il), the Day of the Shining Star. The Union of Agricultural Workers of Korea and General Federation of Trade Unions held several events, including poetry recitals and art performances and declamation and speech events. 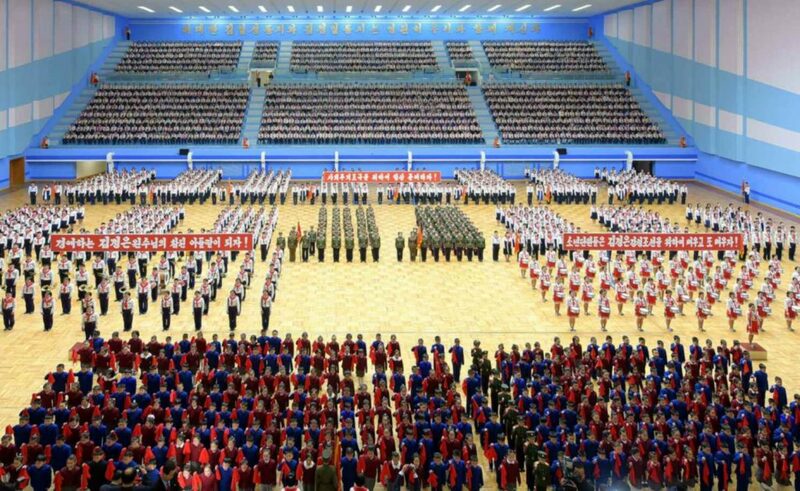 A gathering and induction ceremony of the Korean Children’s Union in Pyongyang on February 16, 2018 (Photo: Rodong Sinmun/KCNA). A meeting inducting new members of the Korean Children’s Union [KCU] was held on February 16 (Friday). 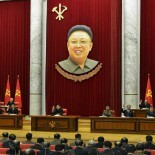 Gathered for the meeting were KCU representatives from the provinces and school-aged children from Pyongyang. Attending the meeting, by invitation, were Workers Party of Korea [WPK] Vice Chairman for Workers’ and Social Organizations Choe Hwi [Ch’oe Hwi], DPRK Vice Premier Jon Kwang Ho [Cho’n Kwang-ho], Education Commission Chairman Kim Sung Du [Kim Su’ng-du], officials of the Youth League and DPRK Cabinet, war veterans and merited DPRK citizens. Youth League 1st Secretary Pak Chol Min delivers a report during a KCU meeting on February 16, 2018 (Photo: Korean Central Television). 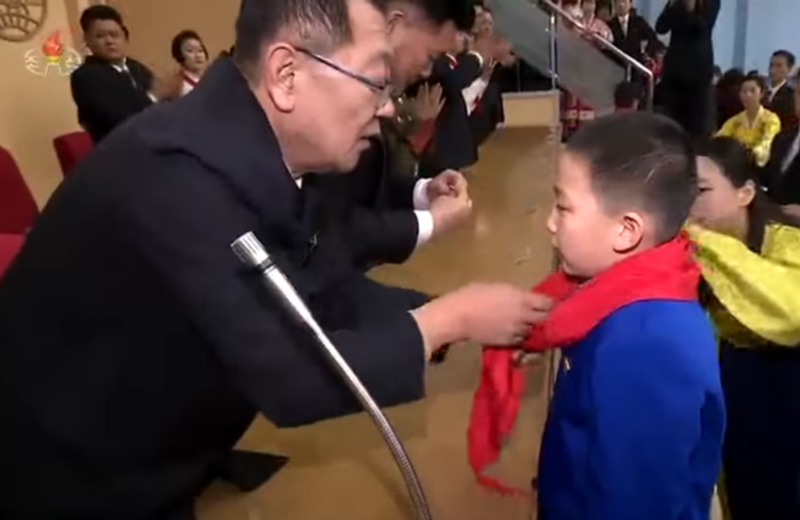 WPK Vice Chairman Choe Hwi ties a red neckerchief around a new member of the Korean Children’s Union on February 16, 2018 (Photo: Korean Central TV). After the report, new members were admitted to the KCU and Choe Hwi led them in an oath. After this the various VIPs tied red neckerchiefs and pinned KCU badges to their clothes. KCU Members called out in response to the slogan “Let us always be ready for the socialist country” and congratulatory speeches were made. 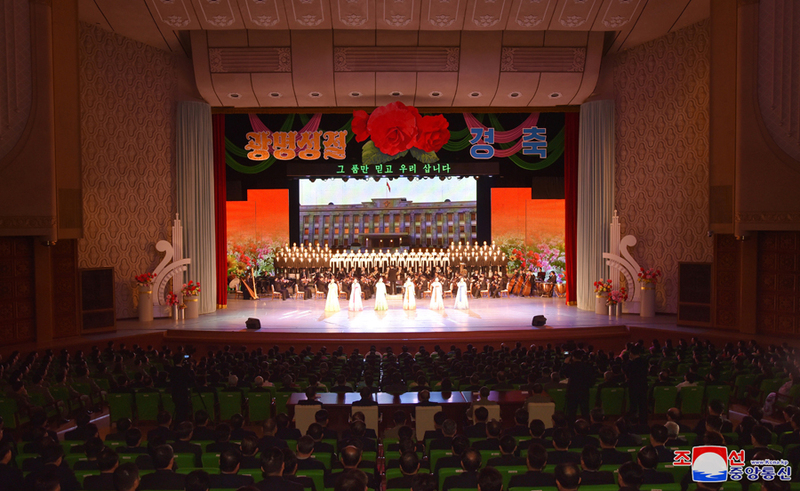 Concert at the East Pyongyang Grand Theater on February 16, 2018 (Photo: KCNA). 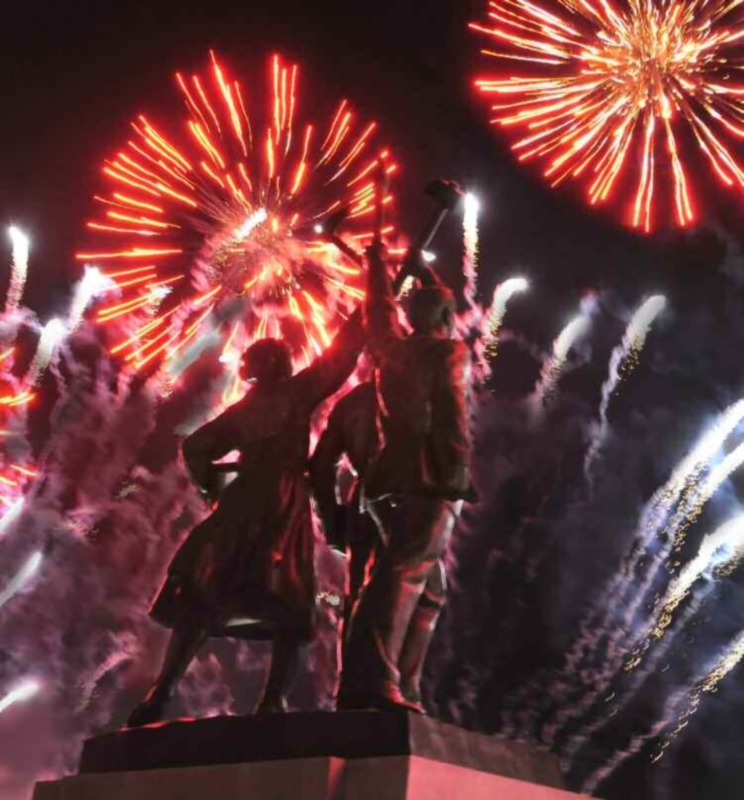 Pyongyang citizen applaud during the February 16, 2018 fireworks display over the Taedong River (Photo: KCNA/Rodong Sinmun). 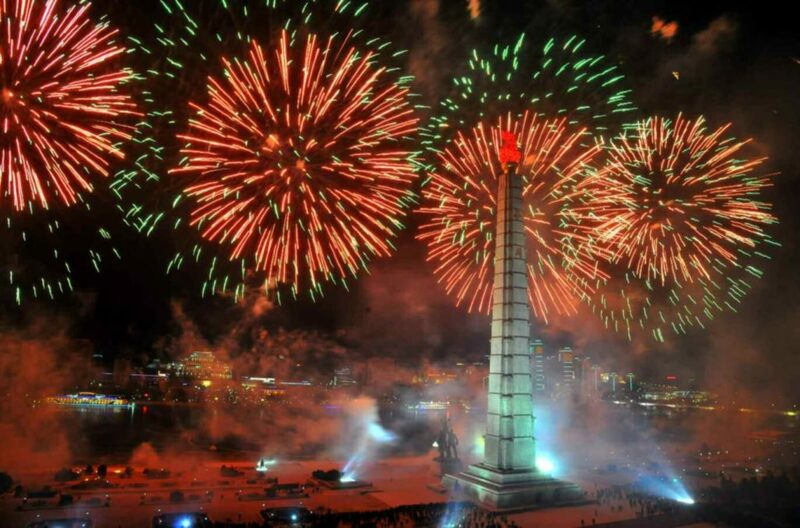 Fireworks over east Pyongyang as seen from Mansu Hill on February 16, 2018 (Photo: KCNA). 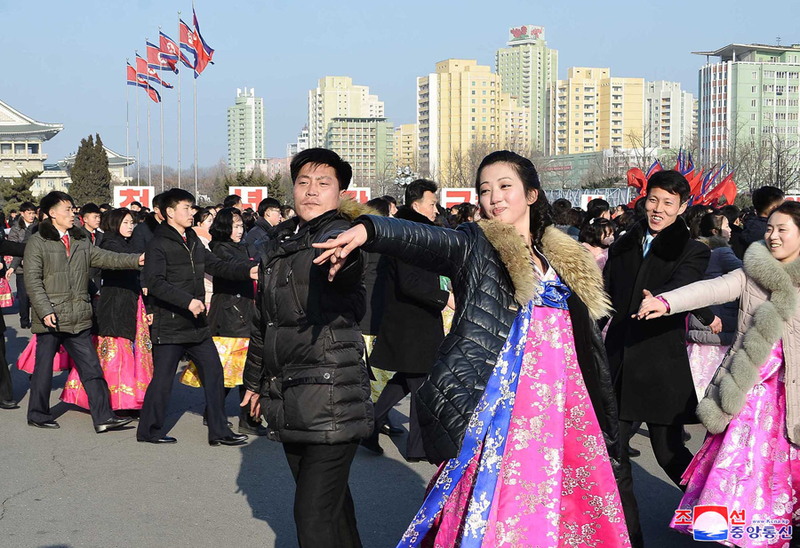 A dance party of DPRK college students in the plaza in front of Pyongyang Indoor Stadium on February 16, 2018 (Photo: KCNA/Rodong Sinmun). 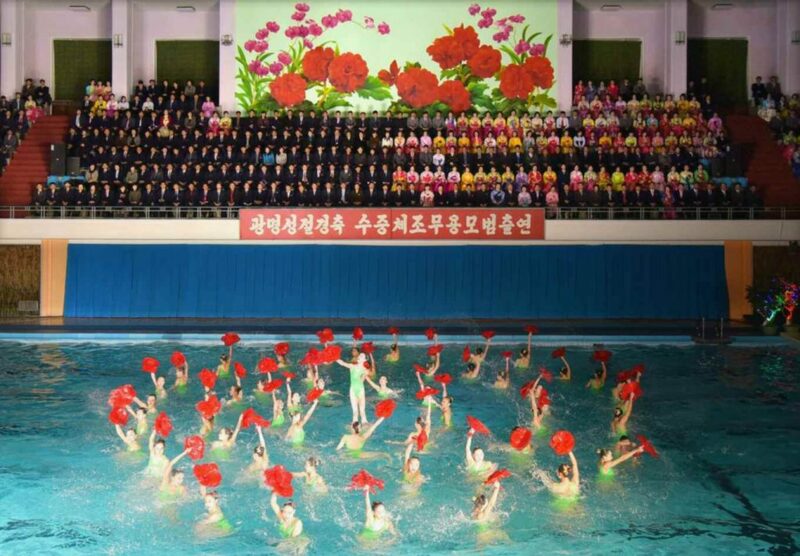 Synchronized swimming performance at Changgwang Health Complex in central Pyongyang on February 15, 2018. This annual performance was one of the only public events which late DPRK leader Kim Jong Il attended on his birthday (Photo: Rodong Sinmun/KCNA). 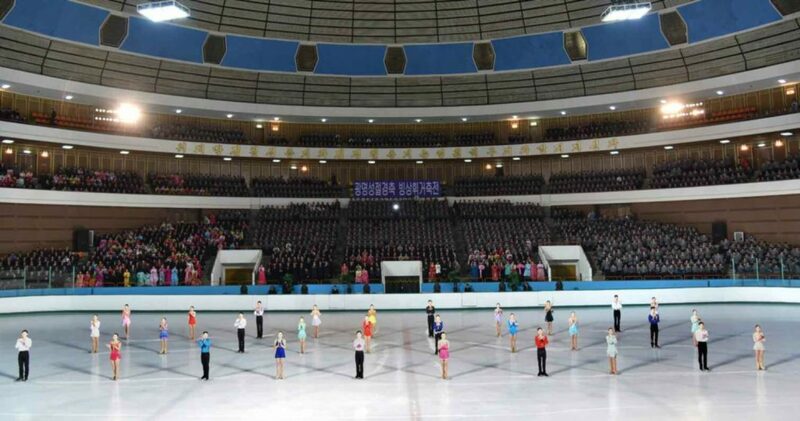 The opening of the annual figure skating festival at Pyongyang Ice Rink on February 14, 2018 (Photo: KCNA). The annual KJI birthday figure skating festival opened on February 14 (Wednesday) and closed on February 17 (Saturday). Attending the opening ceremony were Choe Hwi (in his capacity as Chairman of the National Sports Guidance Committee), Minister of Finance and DPRK Figure Skating Association Ki Kwang Ho [Ki Kwang-ho], Secretary-General of the National Sports Guidance Committee Kim Chun Sik [Kim Ch’un-sik], other DPRK Cabinet and sports officials, Pyongyangites and students. 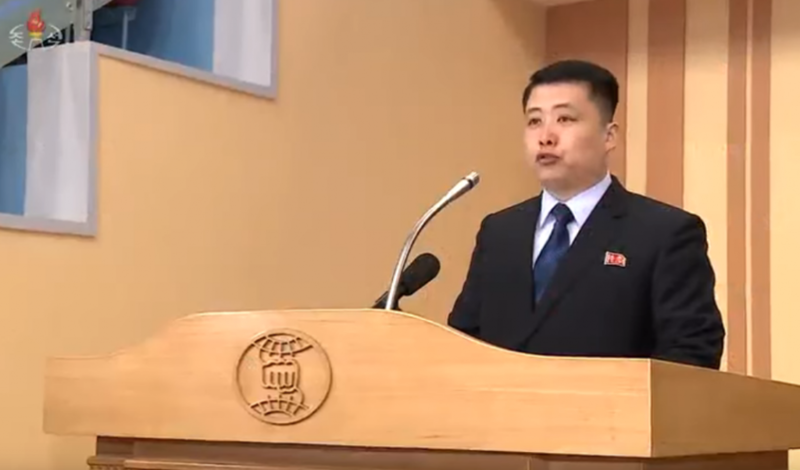 1st Vice Minister of Physical Culture and Sports Kim Jong Su [Kim Cho’ng-su] made a speech. 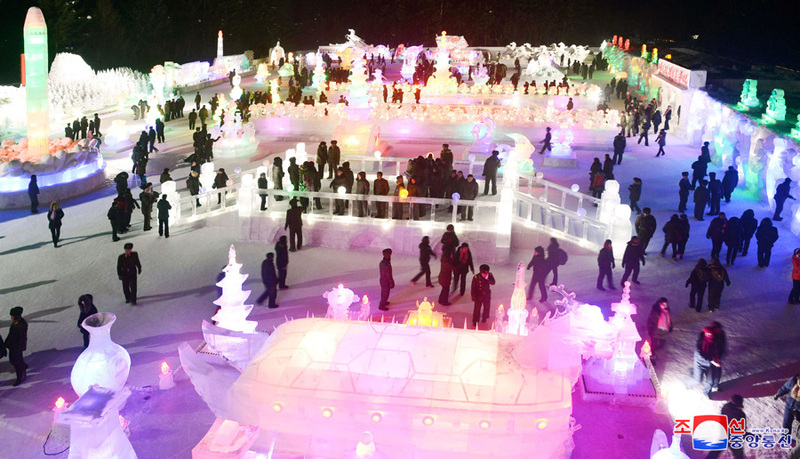 Overview of the Ice Sculpture Festival in Samjiyo’n County (Photo: KCNA). 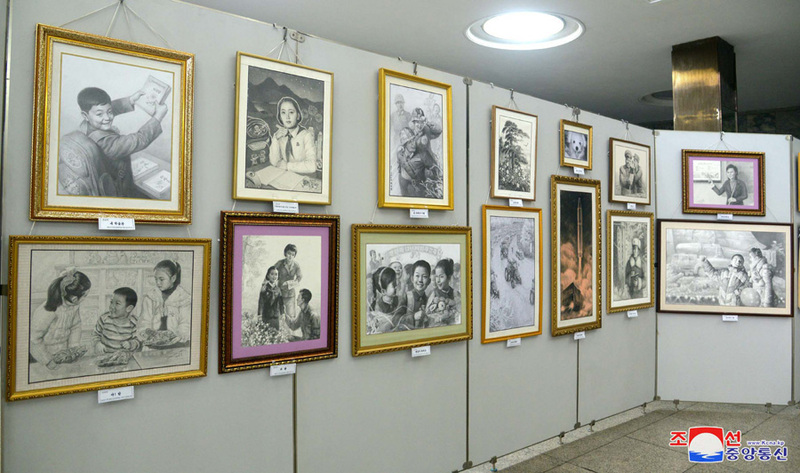 View of pencil sketches at the 7th Annual National Pencil Drawing Festival (Photo: KCNA). 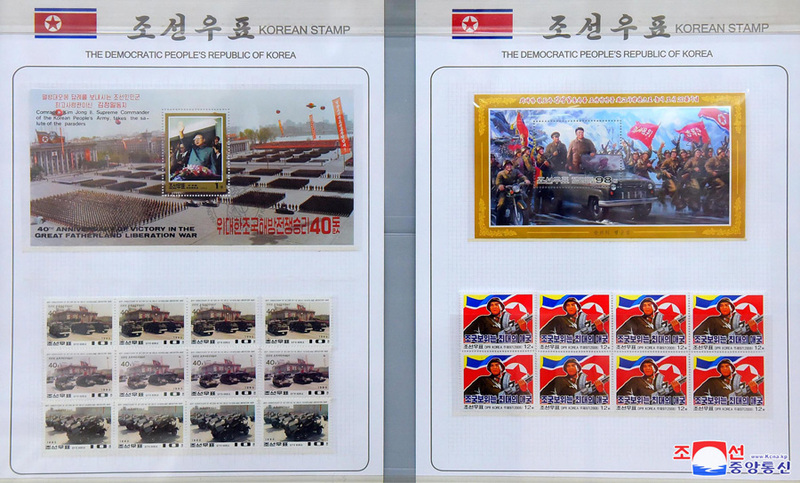 Stamp exhibition by the State Stamp Bureau under the Ministry of Post and Telecoms which opened on February 10, 2018 (Photo: KCNA). 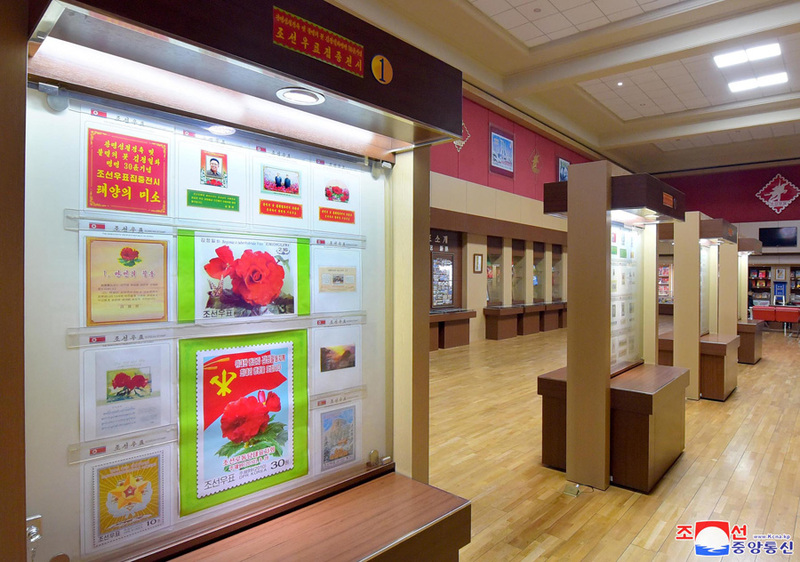 View of stamps on display in an exhibition opened on February 10, 2018 (Photo: KCNA). 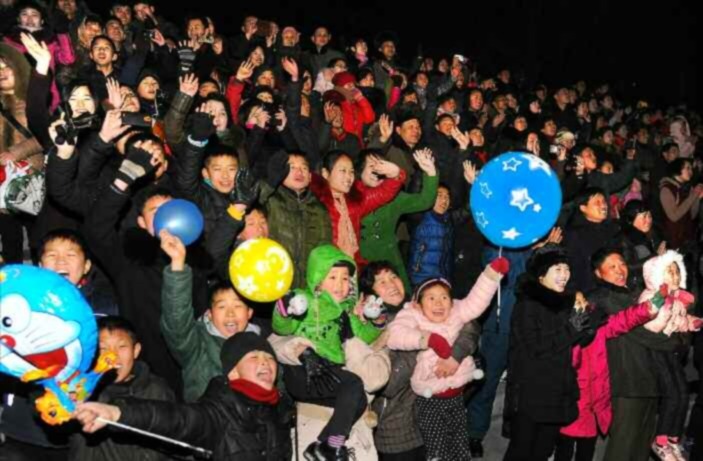 Kimjongilia Festival (Photo: Rodong Sinmun/KCNA). 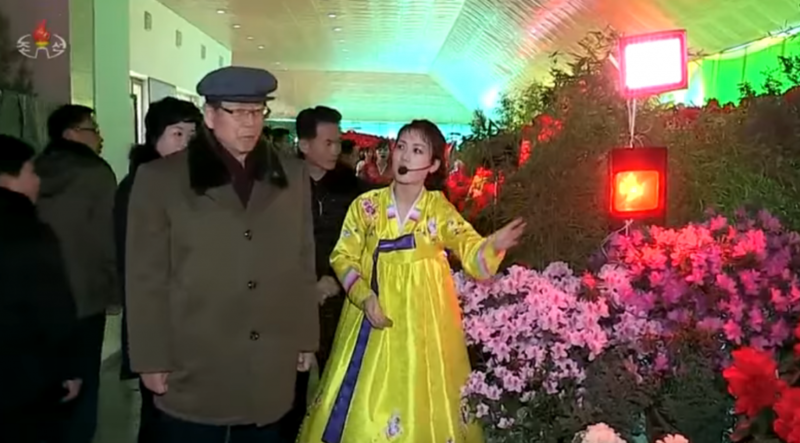 Former WPK Vice Chairman for Sciences and Education Choe Thae Bok is given a guided tour of the Kimjonilia Festival in Pyongyang on February 16, 2018 (Photo: Korean Central Television). 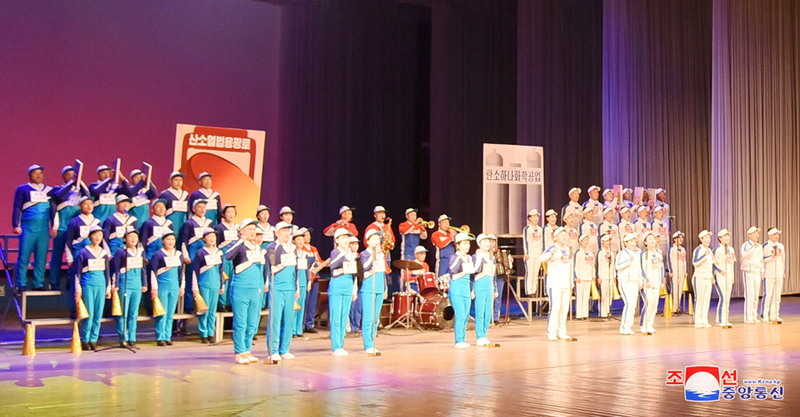 University students in Pyongyang give a joint performance to mark KJI’s birthday (Photo: KCNA). 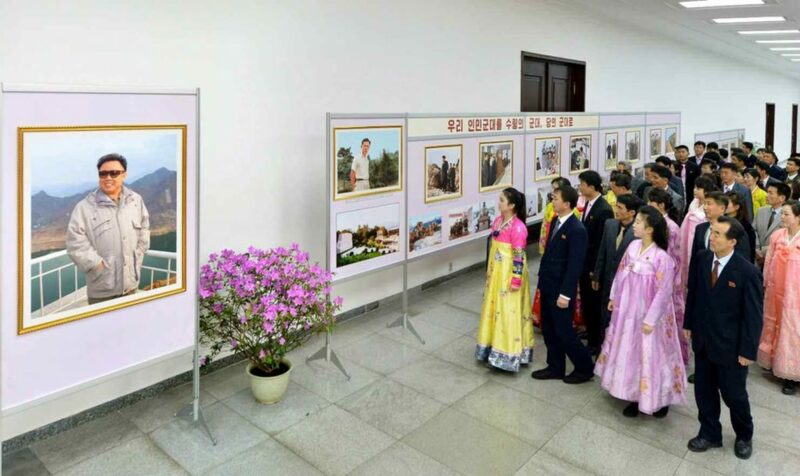 A photo exhibition opening ceremony in the lobby of the People’s Palace of Culture on February 9, 2018 (Photo: KCNA). 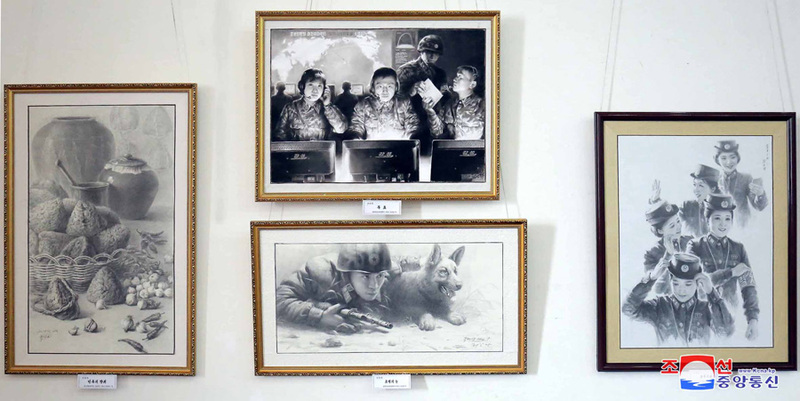 Photo exhibition commemorating KJI’s birth anniversary (Photo: KCNA). This article was written on 19 Feb 2018, and is filled under 2018 Day of the Shining Star (KJI Birthday), 2018 Military Promotion, basic party organizations, Cadre Affairs, Central Committee, Central Military Committee, central party life, Choe Hwi (PAD], Choe Jong Ryong [SHW WPK], Chongryon, Chosen Soren, county/city party organizations, Culture Section (bureau), DPRK Cabinet, DPRK education system, DPRK External Relations, DPRK Sports, DPRK Stamp Bureau, Economic Complexes, Education Commission, Education Section (PAD), Executive Policy Bureau, Fatherland Liberation War (Korean War), General Affairs, General Federation of Trade Unions of Korea, Gifts Office, Guard Command, ideological slogans, Im Chol Ung (DPRK Vice Premier WPK PB), Information Section, internal security, International Affairs Department WPK, International Department, Jagang KWP Provincial Committee, Jang Chun Sil (KDWU), Jon Kwang Ho, Ju Yong Gil (GFTUK), Kaeso'ng City (municipal) KWP Committee, Kang Jong Gwan (Minister of Land and Marine Transport), Kang Pan Sok Revolutionary School alumni, Kang Yang Mo, Kangwo'n Provincial KWP Committee, KCNA, KCTV, Kim Chang Yop (UAWK), Kim Chun Sik [MPCS], Kim Family, Kim Il Sung Youth League, Kim Jae Ryong (Jagang WPK Provincial Committee Chief Secretary), Kim Jong Im, Kim Jong Su [1st VM PCSM], Kim Jong Un Visits, Kim Jong-il, Kim Jong-un, Kim Nung O (NPyongan WPK), Kim Sung Du, Kim Tok Hun, Kim Yong Dae, Kim Yong Nam, Kimilsungia-Kimjongilia Committee, Kimilsungia-Kimjongilia Flowers, kisyl, KJI death, KJI Personal Secretariat, KJI-Ko Yong Hui Family, KJI/KJU Ideological Works, Korean Children's Union, Korean Committee for Cultural Relations with Foreign Countries, Korean Democratic Women's Union, Korean People's Internal Security Forces, Korean People's Army (KPA), Korean Workers' Party (KWP), KPA construction battalions, KPA construction brigades, KPA General Political Bureau, KPA General Political Department, KPA General Propaganda Department, KPA Organization Department, KPA Party Life, KPA supernumerary organizations, KPA WPK Committee, kpif, Lecture Guidance, Local Party Affairs, local people's committees, military security command [msc], Minister of People's Security/KPISF construction units, Ministry of Common Education, Ministry of Culture, Ministry of Education, Ministry of Finance, Ministry of Fisheries, Ministry of Land and Marine Transport, ministry of people's security, Ministry of People's Security engineering units, Ministry of Physical Culture and Sports, Ministry of Post and Telecom, Ministry of State Security, Ministry of the People's Armed Forces (MPAF), Namp'o WPK Committee, North Hamgyo'ng Province, North Hwanghae Provincial KWP Committee, North Korean press, North Pyongan KWP Provincial Committee, Organization and Guidance Department, PAD Guidance Section, Pak Chol Min [KISYL], party cells, Party elders, Party History Institute, party life, Party Life Guidance, Pochonbo Music Group, Political Bureau, population control, primary party committees, Propaganda and Agitation Department, Provincial Party Committees, Provincial Party System, Provinicial People's Committee, Public Events, Public Information Commission, Publications, Pyongyang City People's Committee, Pyongyang Defense Command, Pyongyang WPK Committee, Ryanggang KWP Provincial Committee, Samjiyon Orchestra, Secretariat, Sinuiju City People's Committee, social control, South Hamgyo'ng KWP Provincial Committee, South Hwanghae KWP Provincial Committee, South P'yo'ngan KWP Provincial Committee, State Affairs Commission, State Physical Culture and Sports Commission, State Planning Commission (SPC), State Security Department, Supreme People's Assembly, theoretical works, Third Economy, Third Floor, uawk, Wangjaesan Group, worker peasant red guard, Worker Peasant Red Guard, Workers' and Social Organizations, Yang Hyong Sop, Young Red Guard, Youth Shock Brigades.